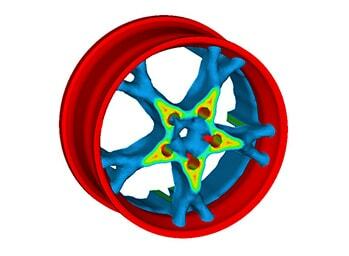 Altair OptiStruct is an industry proven, modern structural analysis solver for linear and nonlinear structural and thermal analysis for structural evaluation and optimization such as powertrain durability assessment. 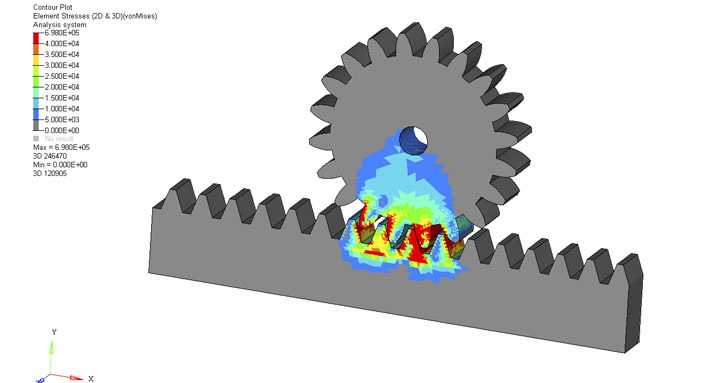 OptiStruct is a highly efficient solver for linear and nonlinear structural analysis and thermal analysis. 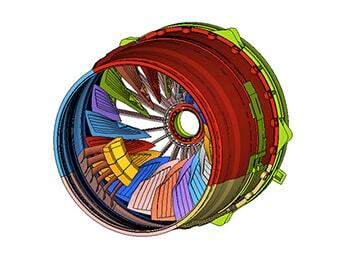 The underlying algorithms provide engineers with accurate results in the shortest time. Application areas include strength and stiffness evaluation, durability, thermal contact and stress analysis. Nonlinear capabilities include contact, bolt pretension, gasket elements, large deformation of hyperelastic materials with follower forces. 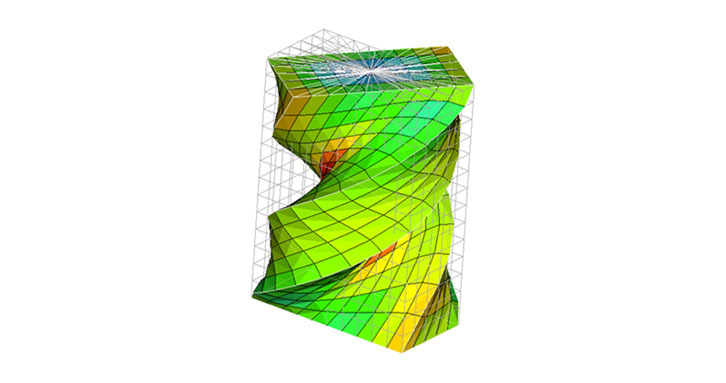 OptiStruct is a full featured solver for linear structural analysis. 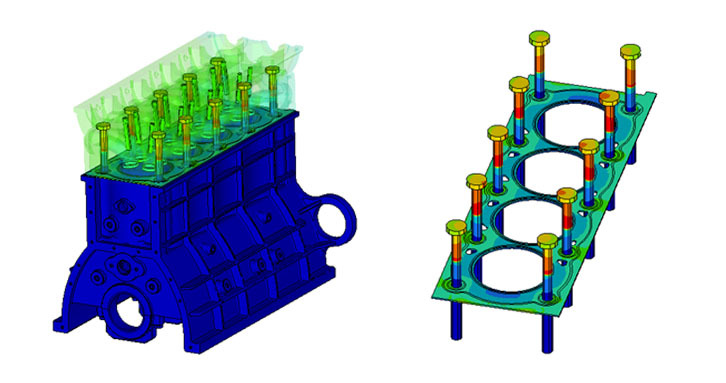 It supports point (SPC) and multipoint (MPC) constraint boundary conditions as well as rigid elements and rigid bodies. Alternate coordinate systems based or the basic system or each other can be defined for easy grid location definition. Loads can be distributed on the surface of shells and solids as well as along the length of beam elements. In addition, imposed displacements and inertia relief loading is available. Thermal loads include convection and heat generation. OptiStruct supports a full set of elements including solids, shells, beams, rods, bushings, spot welds, seam welds, joints, point masses and single DOF mass, stiffness and damping. Composites can be modeled property by property, or the more practical use of ply and stack definitions. Beams can be defined by area and inertias, and also by cross sectional dimensions. Axisymmetric elements and loads are also available. 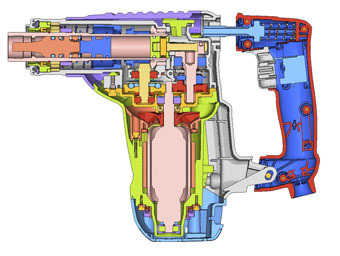 Models can be specified as a collection of parts that are instanced, relocated, and connected. Additionally, sub-modeling is available for more accurate stress resolution in critical areas. Analysis results, such as stresses and strains, can be calculated at element centers, Gauss points, and corner points. Also available are grid point stresses and strains, element forces, and strain energy. Other output types include composite ply stresses and strains as well as interlinear shear. Multiple composite failure models, such as Tsai-Wu, Hill, Hoffman, Maximum Strain Theory, and Hashin are included. The composite stresses and strains as well as failure indices can be calculated at multiple planes within each ply. Applied loading, constrain forces, and rigid element forces can also be output. All output is available in the Altair H3d format as well as the .op2 and .pch file formats. Pretensioned bolts can be modeled with 1D (Beam) or 3D (Solid) elements. The bolt pretension can be specified as a force or shortening distance. The pretension force can be output. Bolts can be pretensioned incrementally one by one or in groups. 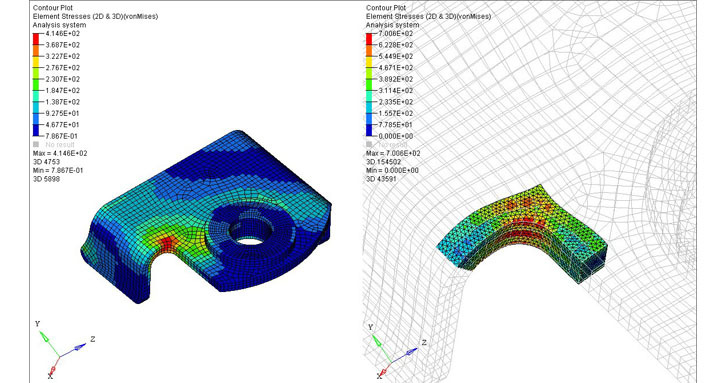 For contact analysis, both node-to-surface and surface-to-surface methods are available. The contact conditions can be FREEZE (TIED), STICK, or SLIP with friction. Surface-to-surface contact can be more accurate for curved surfaces. A special case of surface to surface FREEZE contact that automatically generates multipoint constrains (MPC) can be used to reduce computation time. 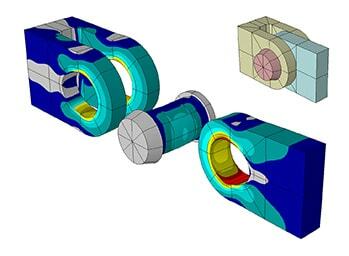 In addition, if there is SLIP contact with no friction and no other nonlinearities (linear materials and small displacements), a special linear contact algorithm can be used that is up to 10 times faster than traditional contact calculations. For second order solid elements, a contact friendly element formulation is available. Use of these contact friendly elements reduces contact “chatter”, speeds convergence, and produces a smoother contact pressure distribution. For irregular meshes, the CLEARANCE command can be used to remove initial penetration, or specify an initial gap. The ADJUST command can be used to specify a uniform initial penetration. Contact output includes contact pressure and force, contact status; opened, closed, or penetration, as well as slip distance and frictional force. The contact forces can be output element by element or surface by surface. Contact results are output for both the master and slave surfaces. Contact area for each surface can also be reported, as well as the total forces on the contact surface. Domain Decomposition allows for the use of multiple processors to dramatically reduce analysis time. Elasto-plastic nonlinear materials with isotropic, kinematic and mixed hardening are available. Nonlinear elastic stress strain curves can be specified with tabular input, as well as multiple temperature dependent curves. Nonlinear temperature dependent gasket material properties are available. 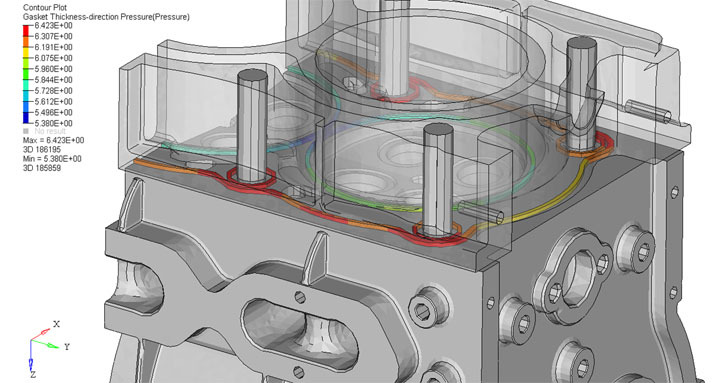 The gasket material models are nonlinear elastic with plasticity and hysteresis. Damage pressure is taken into account. Leakage pressure and contact pressure results are available for the gaskets. Furthermore, hyperelastic materials can be used for large displacement analysis. Hyperelastic material models include Neo-Hookean, Mooney-Rivlin, Yeoh, Arruda-Boyce, and reduced polynomial input, as well as tabular input of uniaxial, biaxial, and planer experimental values. Large deformation analysis with finite sliding for isotropic, anisotropic, and hyperelastic solid models can be performed. Follower forces can be used in large deformation analysis. Large deformation analysis can be specified subcase by subcase. OptiStruct includes linear steady state heat transfer analysis with convection and fixed flux or temperature boundary conditions, and internal element heat generation for loading. Temperature and flux output results are output to the various results files. 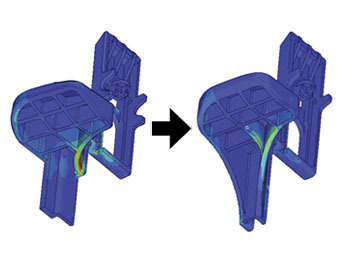 After the heat transfer analysis, the resulting thermal field can be applied as a load on a static structural analysis and the thermal deformation and stresses are calculated. When the thermal material properties are temperature dependent, nonlinear static heat transfer analysis could be performed. 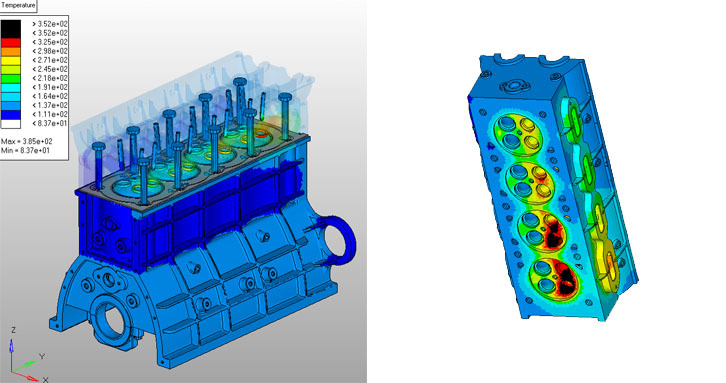 Finally, OptiStruct is capable of linear transient heat transfer analysis. Ambient and grid point temperatures can be specified as a function of time. Also, heat flux and heat generation can be specified as a function of time. At specific time steps, the thermal field at that time step can be applied as a structural load. The thermal deformation and thermal stresses for that time step are then written to the various results files. LW Finder from LW Engineering provides accuracy and control when using strain gauges to measure structural loads. LW Finder takes the guesswork out of strain gauge placement by finding the best locations to place strain gauges and predicting measurement error.